For the past year, I’ve been studying how learners use emoticons, emoji, and text speak to communicate, read and write. Emojis are part of digital literacy and citizenship. When our learners use emojis in their writings, they are humanizing their digital experience. They are letting others know how they feel, offering feedback, and revealing their tone. Our learners are also translating, decoding, playing with language, creating pictograms, and contributing to an international communication system. I have developed various emoji activities to engage learners and have been sharing them in my latest keynote, I My ! 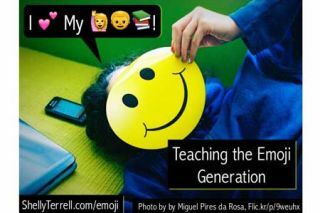 Teaching the Emoji Generation! Teaching the Emoji Generation. Below, I’ve included a new activity I recently saw posted by my Tia Diane on Facebook. Students can copy and paste this form to any virtual learning environment (Edmodo, Schoology, Moodle, etc. ), fill this out on their digital device, or fill out a handout responding to the categories. They can include emojis from an emoji keyboard or copy/paste emojis from Emojipedia. After filling out the form, students can look at their peers’ responses and try to guess the answers. They then discuss the responses and learn about each other. Use this activity as a warm-up, icebreaker, or filler. For more ideas, take a look at the slides to my presentation! Challenge: Engage your students with an activity, which gets them to use emojis to express themselves.